We had a happy Sabbath yesterday. My Primary music went well as we learned I'm Trying to Be Like Jesus. I had also taught them If the Savior Stood Beside Me -- they love that song and sang with gusto and the Spirit was strong as they sang. These children know so few of the Primary songs but they learn extremely quickly. They are the future of the church here in Africa. They are lucky, or rather, blessed, to grow up in the church. So many of the adults are converts who never had the chance to go to Primary in their youth. Many of our African missionaries are also converts and they love learning the Primary songs. Primary songs teach the gospel very clearly and simply. My Primary lesson for ages 8-11 went well also. (My lessons don't always go well!!) The lesson was on forgiveness and it was very apropos for the election period that we are in now. Daisy, a sweet little 10-year old, gave our opening prayer and prayed for peace during the elections. We talked about how people do bad things to us sometimes but we must learn to forgive. They know all the right answers; the problem is to "do" as it is for all of us. I love the way Africans say, as they are leaving you, "Be blessed." Or, "Have a blessed evening." Nice to hear that from the armed guards who search our vehicle as we enter the shopping mall. So nice to be here in a country where people are unafraid to say the name of Jesus Christ. Such a pleasant change from in the West. Below are pictures from this past week and also from our recent trip to Kisumu and Busia when LeRon audited the branch books. LeRon and I absolutely love getting out of the city into the countryside. This is a very beautiful country. Be sure to click on the pictures to enlarge. We love Japanese food. LeRon served a mission to Japan in his youth and when we married, he introduced me to Japanese food. Our family loves the sticky rice, the teriyaki, the miso soup, the donburi, the gyoza, the vegetable sushi. Here in Nairobi, we've found a great Japanese restaurant very close to where we live -- it's called Haru and is on Karen Road. A meal of chicken teriyaki comes with delicious vegetables, a bowl of yummy sticky rice, and a bowl of miso soup. Along with that, they give you a salad starter with delicious peanut dressing. One meal each actually gives us two meals each as we take some home for the next day. LeRon has been trying to get the cook to cut the chicken up in slivers instead of chunks but to no avail yet. Before we go, we hope to succeed! It's a cute little restaurant with good food. On Saturday, our African grandchildren -- Faye, Joy, and Prince -- popped over to visit. We were busy getting our Primary lessons ready so I got out crayons and paper for them to draw. It was Faye's idea to draw a picture of Jesus. Prince saw the picture of Jesus on our wall and decided to copy it. I was amazed at Prince's ability. I can't draw faces at all. Prince was pretty proud of his drawing, which he should be. Then he wrote his name on it: Prince. And I said, "Did you know that Prince of Peace is another name for Jesus?" He didn't know it but thought that was really cool and so he wrote "Prince of Peace" on it. Joy tried to draw a picture of Jesus, but was unable to so she drew a rainbow. Good job Joy. Faye started by first drawing the children surrounding Jesus. She took the picture of Jesus and the children home so she could work on it. See the first picture of the kids drawing to see the picture she is copying. Good job! Faye's mom, Enid, is a good friend of mine. She's the age of our oldest son, Michael. I enjoy visiting with her. She's a school teacher in the International School Faye goes to. Enid is actually from Uganda and has lived for many years in England so talking with her is not like talking to a Kenyan. More like talking to a European. She's a lovely person. Now on to pictures of our recent trip to Kisumu and Busia . . . We saw several very bad accidents on this trip to Kisumu, mostly involving big tankers or semis. Not sure what happened but it made us pay more attention to our driving. Now we're in sugar cane country. Lots of trucks and wagons pulled by tractors hauling sugar cane to the factory. We could hardly believe what we were seeing -- a load of dead chickens on the top of this vehicle! But upon looking closer, we saw that the chickens weren't dead at all. They were alive and strapped on to the car. Poor chickens. They probably died of fright before they got to the market!!! Click to enlarge! 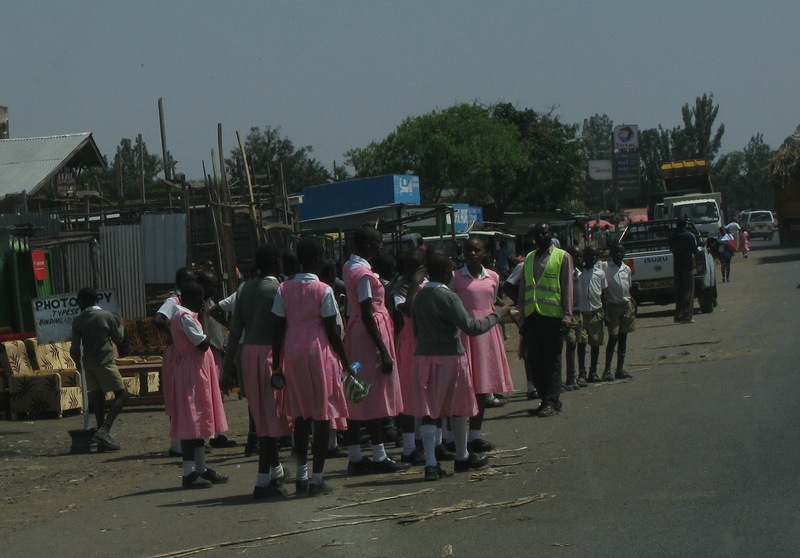 All school children wear uniforms and they walk to and from school each day. More school children, this time in pink. Nice to see so many children out and about without fear for their safety. Sugar can falling out of a loaded truck. I tried to snap a photo of these school children walking in the middle of nowhere but my camera was too slow. Oh well. As soon as I saw these fields, I wondered if they were fields of rice. Certainly looks like rice. We saw many fields of rice on our trip to China a few years ago. Every little piece of land had rice growing on it, even the tiniest plot. Rice for sure grows in Kenya, so I think this might be rice being watered from a ditch. I know that rice takes a lot of water, which Kenya does not have, at least not this year. They grow Pishori rice here and it is very good. Dried up corn stalks are stooked and will be used for cattle feed. LeRon says maybe that's why the cattle are so skinny -- not a lot of nutrients in corn stalks. If you look closely, you can see piles of bricks. We think they are drying in the sun and the grass is on top of them to keep the water off. We saw lots and lots of bricks covered with grass. Love to see the local markets! And the people, having finished their business at the market, are on their way home. Lots of walking here! Always amazes me how they carry things on their heads. Good for the posture. Anything can be carried on a bicycle! Life seems a bit laid back around here! We crossed the equator at the village of Maseno. From Kisumu heading to Busia, you cross into the northern hemisphere and from Busia to Kisumu you cross into the southern hemisphere. Nairobi is in the southern hemisphere just a few miles south of the equator. Never thought I would be so cold on the equator as I am in Nairobi!!! As I write, I have my little space heater turned on and going full blast!! Brick houses and people going about their daily lives. So different than in the city. Nice to see no walls for people to hide behind! Life seems pretty laid-back here. Just sitting around, waiting for someone to come and buy. So unlike the hectic life of people in the West. I still don't like to see vegetables, especially potatoes, sitting around in the sun all day. Note the man in the red shirt just lying by the side of the road. We often see men taking a nap right by the highway or on a hill overlooking the highway. We often wonder how they choose the particular spot to take a nap. Of course this man is relaxing next to his vegetable stand so that is understandable. A donkey is pulling this loaded cart and the man is ready with his whip. That's why there are "donkey sanctuaries" here. They have KSPCA's here like they do at home only here they are for donkeys. (Kenya Society for the Prevention of Cruelty to Animals). We've been on this particularly highway about 10 times in the past year and we always enjoy driving through this forest. This time we pulled into the forest for a pit stop and were surprised to find out that it has been planted for logging. Didn't know that before. Interesting to have evergreens on the equator. Love these straight rows! You can see how the logging is taking place. Trees grow really fast here (as you'll see when I post about President Okila's banana farm).